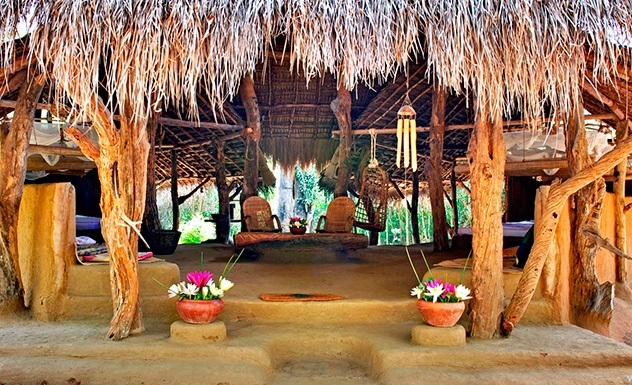 Leave everyday stresses firmly behind by entering the idyllic and romantic world of The Mudhouse in Sri Lanka’s rural North-West. 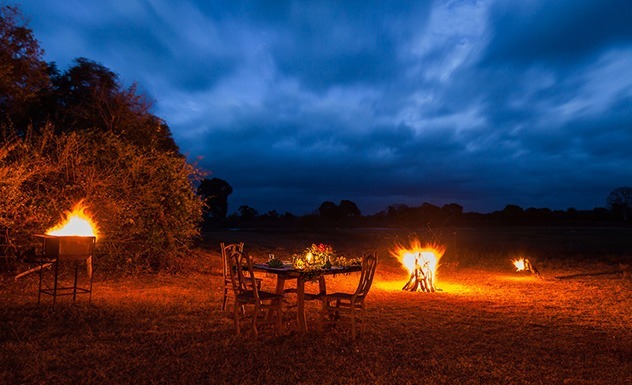 With no signs to guide you into the 60 acres of dense jungle that hides a number of contemporarily designed huts, it’s well hidden and incredibly private. 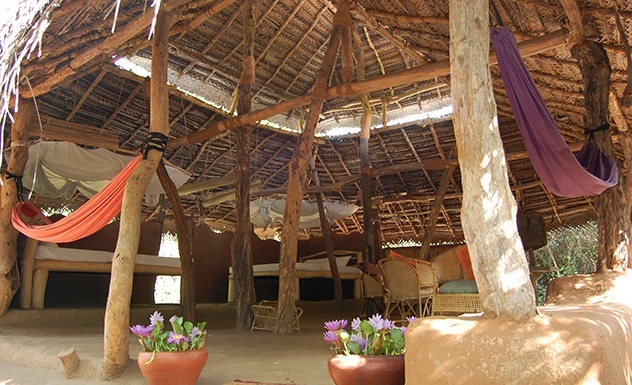 Mud walls are smoothed over to give a polished finish to the earthen accommodations which are located in clusters in three separate jungle zones. Attention to detail is second to none; bowls of purple lotus flowers, driftwood furniture, vibrantly colored cushions, hammocks and swinging chairs add a stylish touch while the adjacent lake makes for a refreshing bath. 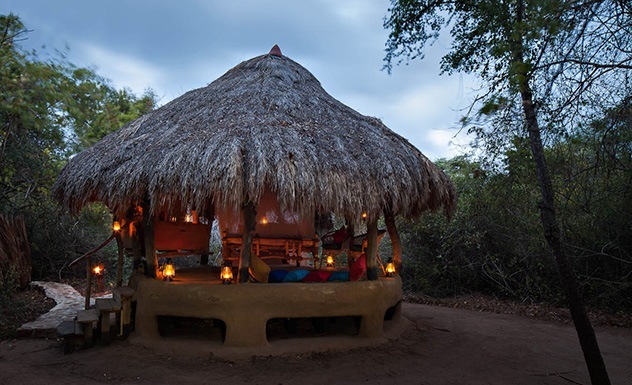 Accommodation options range from traditional village house to al-fresco open sided doubles, a tree house and a family hut. 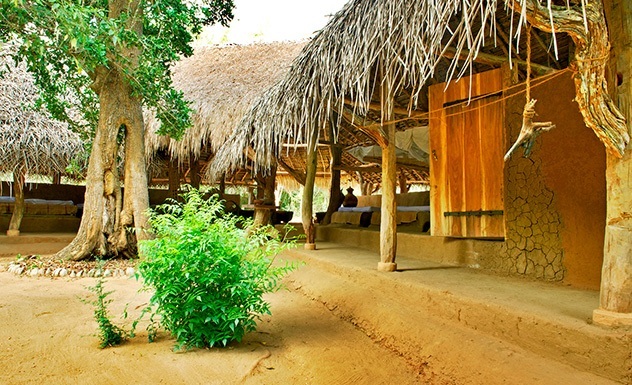 A typical village mud house, the main part consists of a master bedroom, living area, western toilet and veranda. The second structure houses two single beds with views of the lake and the outdoor shower and washing area are found in a separate unit. 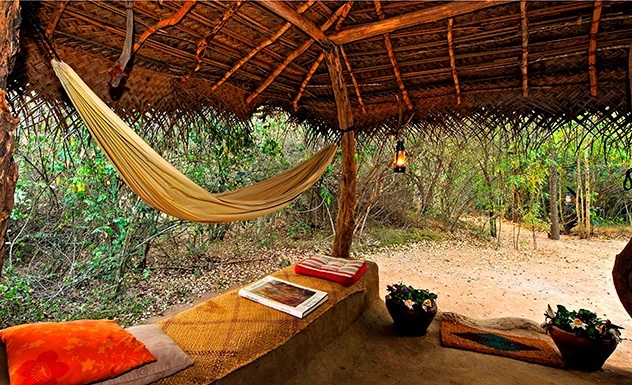 There is also an al-fresco hut that can be used to lounge in or as an additional room. The Family Hut includes two double beds as well as a large lounge area and built-in storage cupboards and comes with an outdoor bathroom. 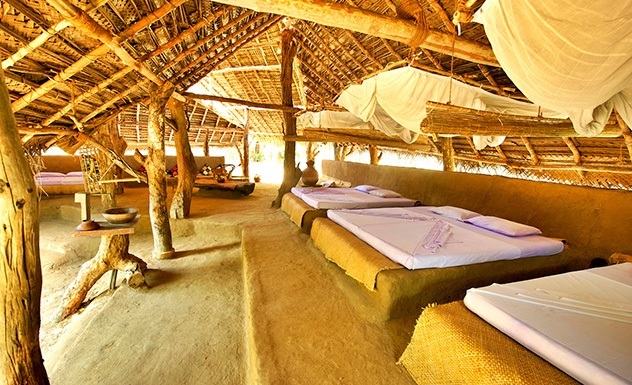 The Honeymoon Hut comes with a double bed raised on stilts, and is surrounded by rattan blinds for more privacy. This has an outdoor shower and enclosed wash room. Equipped with three beds, the unusual ‘V’ shaped Palu Hut also includes two luggage/ changing rooms, two outdoor showers and two bathrooms. Relax in the outdoor seating area, garden or in the hammocks set up inside. Exuding contemporary elegance, Maha Gedara features five large beds, an open central courtyard, lounge and dining area. 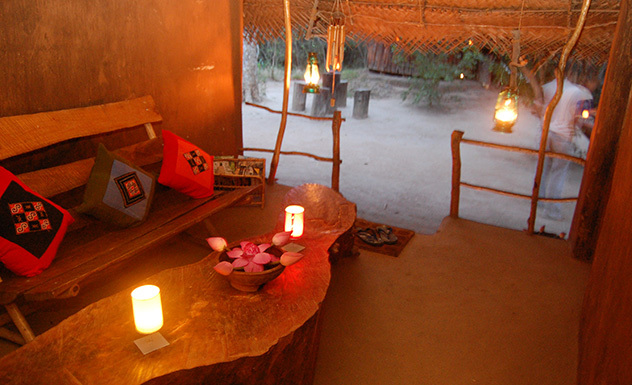 Solar powered LED lighting is also backed by candles and lanterns at nightfall. In addition to the semi-outdoor bathroom, there is a jungle shower positioned behind the hut which is a highly enjoyable experience. 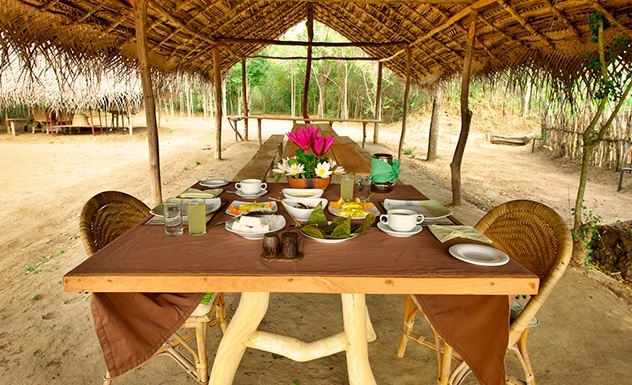 The freshest local ingredients are sourced either from the farm or the markets at the nearby town of Anamaduwa. Lunches and dinners include a spread of colorful curries. While preferences are taken into account, the emphasis is on traditional local cuisine using produce commonly grown in the area. The snack boxes in the huts act as mini bars. Hot drinks are available at any time of the day; along with all meals and snacks, as they are included in the accommodation rate. However Mudhouse does not serve alcohol. 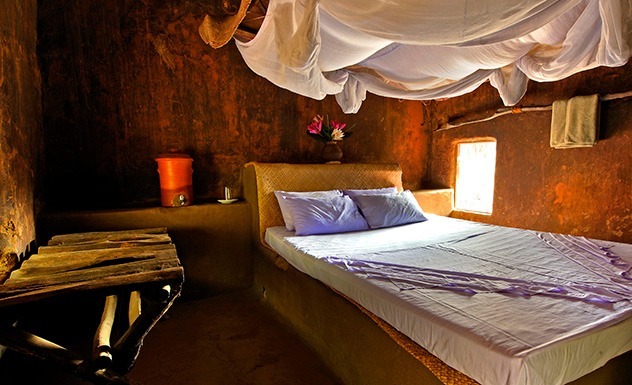 The Mud House is family friendly and ideal for those who like adventure and an outdoors lifestyle.